I remember the days when I used to go grocery shopping every time I cooked a meal. Towards the end of my work day, I would pick a recipe, make a grocery list, then stop at the store on my way home. Now that we have Darcy, that's just not an option anymore! Now I make a weekly menu plan on Saturdays and also do my shopping that day. I love (I mean really love) the process of choosing recipes, making lists, and going shopping, so I was on the look out for a cute menu planner to post on the side of my fridge. After spending way too much time looking, I found the perfect one over at Future Girl. Download it yourself to bring a little bit more joy to your menu planning process! In honor of the Fourth of July, Rachael Ray shared with Parade Magazine what she thinks is great about America. 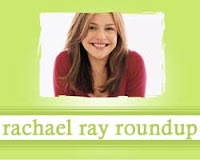 Dr. Scott offers some thoughts on love advice offered by Rachael Ray. Julie of The Persnickety Palate made Rachael's recipe for Big Beef Meatballs with Bucatini. Jody of Wine, Women, and Song made Italian Chicken with Dumplings from BOB. Cake for Breakfast features a review of Rachael's recipe for Poquito and Grande: Taquitos and Burritos. Rachael's husband John Cusimano talked to People magazine about his wedding proposal to Rachael Ray. Veggies for Carnivores offers a Middle Eastern twist on Rachael's recipe for Chickpea Salad. Kristin of Sogkonnite Living made Pistachio-Tarragon Pesto Bowties with Peas and Potatoes. Heather of Pecans and Pralines made a Rachael Ray recipe that escaped my notice until now: Brandied Tarragon Cream Chicken (Chicken a la Vallee d'Auge) and Camembert Rice. Camembert rice? Debby of A Feast for the Eyes made Ground Gyros and Tzasiki Sauce. Mare of Meet Me in the Kitchen made Rachael's recipe for Napa Noodles from Everyday With Rachael Ray. Cheap Cookin' Mama made Warm Chicken Piccata Spinach Salad. Thanks for including me! I love the template, will help me start planning ahead, one of my goals.